More than two dozen cities, counties, and private citizens have pitched their ballpark solutions to Gov. Tim Pawlenty's Stadium Screening Committee. The governor solicited outside input to help him decide what role -- if any -- the state might play in financing new facilities for the Minnesota Twins and Vikings. The plans cover a range of sites across the metropolitan area, and offer funding options from local taxes to state dollars to casino revenues. St. Paul, Minn. — Pawlenty's stadium committee is meant to address complaints from the Twins and Vikings that the Metrodome is antiquated and inadequate for the needs of a modern sports franchise. The call for proposals was met by 26 answers, five of them from local governments eager to capitalize on what they believe are the economic spin-offs of new stadiums. St. Paul Mayor Randy Kelly framed the debate as a contest between St. Paul and Minneapolis. "Minneapolis has five of the seven major cultural institutions in it. It has four of the five major sports teams in Minnesota," Kelly said. "And if St. Paul is expected to come to the regional table with a sense of fairness and equity, then I think the ballpark decision is one that should go to St. Paul." Kelly's plan for a $520 million Twins ballpark relies on a combination of team contributions, a city tax on food and beverages, parking revenues, and a rental car tax levied in both Ramsey and Hennepin Counties. A rival proposal from a Hennepin County/Minneapolis partnership, however, argues the team would fare best in downtown Minneapolis. Their plan imagines a $535 million Twins stadium, funded with a team contribution and an unspecified mixture of county-wide bar and restaurant taxes, lodging taxes, and a general sales tax. The Hennepin County/Minneapolis plan seeks $100 million in state funding, something Pawlenty has all but ruled out. But Minneapolis Mayor R.T. Rybak says the state dollars roughly equal the cost of a retractable roof -- an amenity, he says, that is generally considered a statewide benefit. "When people from greater Minnesota talk about the ballpark, they say the one thing we really want is a roof," Rybak says. "Because if it's raining and you're in, say, Minnetonka, you just simply stay home. If it's raining and you're in Pequot Lakes, you've already made the trip." Twins officials were unavailable to comment on the submissions. Mingled with the city and county plans were 21 ideas submitted by private citizens, developers, and state lawmakers. One, from Sen. Ellen Anderson, DFL-St. Paul, offers no direct ideas for building a stadium, but proposes that the Twins be publicly-owned before tax dollars are appropriated on their behalf. Roughly half a dozen ideas, including one by Rep. Tom Hackbarth, R-Cedar, are fueled by gambling revenues to be generated by new casinos in Minnesota. That idea, too, has received a chilly reception from the governor, according to Finance Commissioner Dan McElroy, who chairs the screening committee. "The governor has said he would prefer not to pursue gambling," said McElroy. "What he said was, 'I'm not ruling anything out; it's unlikely I would propose a gaming solution.'" Minneapolis ... has four of the five major sports teams in Minnesota. If St. Paul is expected to come to the regional table with a sense of fairness and equity, then I think the ballpark ... should go to St. Paul. McElroy said one of the more innovative ideas came from Anoka County, which is actively courting the Vikings to relocate in Blaine. The Anoka proposal envisions a football stadium as the heart of a $1 billion development project that would also include a hotel, retail shops, corporate offices, and homes. The plan offers up to $250 million in new local taxes for a Vikings stadium that could cost more than $600 million. 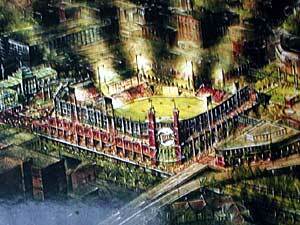 Part of the rest of the funding would come through the sale of development rights around the stadium. Any gap would be filled by contributions from the state and the team. Vikings consultant Lester Bagley said it's too early to say how much the team would be willing to pitch in, but he said he's excited by the depth and breadth of the responses. "The proof is that we've got 26 proposals," said Bagley. "Granted, some of them may not be viable, but there are several that are. And this is progress. This is further along than we've been in the past in this state on a football solution." The University of Minnesota Gopher football team is also looking for a new home field. The university didn't submit a plan to the governor's task force, although U officials have previously discussed a $222 million on-campus stadium. University officials say they expect more than half of those costs to be raised from private donations, although they say they may require state help to complete the project. The screening committee meets next week to begin sifting through the tangle of proposals.